Monsoon is here and the sound of rain makes it only better. Apart from the romanticism associated with the season, monsoon is also the time when the craving for fried food, especially crispy fries, samosas and pakodas along with a cup of hot steaming chai (tea) increases. In case the hunger pangs are troubling you too much and you don’t want to gorge on calorie-laden food, then you can always fall back on good old corn for a quick fix. There are several easy corn recipes that one can whip up in no time and munch on while looking at the rain outside. 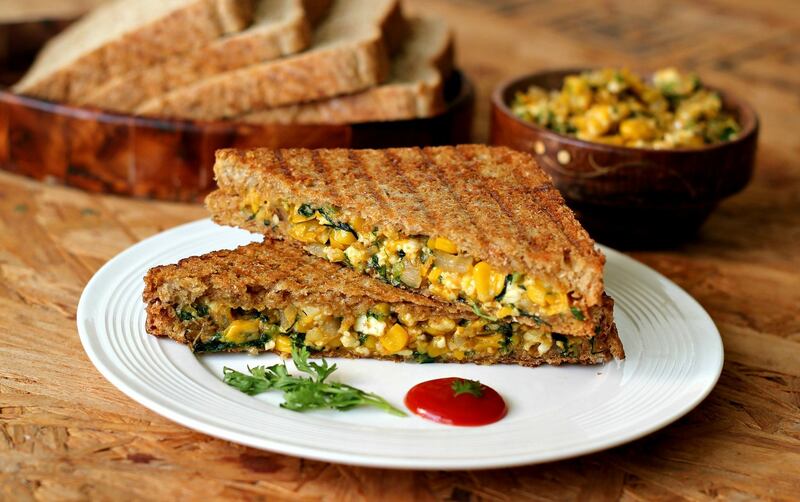 One such is this spinach and corn sandwich recipe by Del Monte. *Wash and blanch the spinach. Cool and finely chop. * Collect the chopped spinach in a bowl and add corn kernels, two tablespoon sandwich spread and mix well. *Take a slice of bread, spread one tablespoon of sandwich spread all over and place spinach mix generously all over the slice. * Take another slice and place over. Keep aside and make another sandwich from rest of the two slices. * Heat a grill pan or a grill sandwich maker with butter. * Place the prepared sandwich and grill from both sides till crisp and golden in color. * Transfer on a serving plate, cut into two diagonally and serve hot.